1] Cellular (e.g. NB-IoT and LTE Category M1) WANs using licensed spectrum. 2] Wireless WANs operating in unlicensed frequency bands. While cellular may be the ultimate winner, Sigfox and LoRAWAN currently have a lot more market traction and are growing very fast. Other non-cellular LPWANs (Ingenu, Weightless SIG, etc.) are also getting some attention, but if there are too many commercially available LPWANs the market will be segmented and fractured. LoRaWAN is specified by the LoRa Alliance which includes 47 network operators. For the Physical layer (PHY), LoRa uses a modulation scheme called chirp spread spectrum (CSS) and a radio both developed and sold or licensed by Semtech Corporation. About two years ago, Semtech licensed its technology to Microchip and NXP (like ARM, Semtech now licenses to other semiconductor companies). As a result, the core LoRa hardware (PHY layer) is no longer provided by a single global chip manufacturer. LoRaWAN defines the media access control (MAC) sublayer of the Data Link layer, which is maintained by the LoRa Alliance. This distinction between LoRa and LoRaWAN is important because other companies (such as Link Labs) use a proprietary MAC sublayer on top of a LoRa chip to create a better performing, hybrid design (called Symphony Link by Link Labs). Many of the LoRa Alliance companies building products are focusing on software defined enhancement and use the LoRaWAN defined MAC. LoRaWAN will most likely be best used for “discrete” applications like smart buildings or campuses, where mobile network connectivity is not needed. Sigfox has the lowest cost radio modules(<$3, compared to ~$10 for LoRa, and $12 for NB-IoT). A recent announcement from Sigfox noted the addition of a new service called “Admiral Ivory,” that makes possible to connect devices with hardware components costing as little as $0.20. An overview of Sigfox’s network technology is described here. It consists of: Ultra Narrow Band radio modulation, a light weight protocol, small frame size/payload, and a star network architecture. The Sigfox network is currently deployed in 36 countries, 17 of which already have national coverage. In February, Sigfox reached an agreement with mobile network operator Telefonica to integrate Sigfox’s low-powered connectivity into the Telefonica’s managed connectivity platform. By complementing Telefónica’s cellular connectivity offerings, with Sigfox’s LPWAN connectivity solution, customers can choose the most appropriate type of connectivity or combine them, implementing use cases and creating new service opportunities that otherwise may not have been possible. While Sigfox is a proprietary IoT network architecture, the company has provided their intellectual property library free of charge and royalty-free to semiconductor companies which have implemented chipsets with dedicated Sigfox interfaces or multi-mode capabilities. The list of chipsets/modules supporting Sigfox (+ multimode) includes: Pycom (+ WiFi, BLE=BlueTooth Low Energy), Texas Instruments (+ BLE), STMicroelectronics (+ BLE), Microchip/Atmel, Analog Devices (+ BLE), NXP, OnSemiconductor (SiP), SiLabs, M2Com, GCT Semiconductor (+ BLE, CatM1, NB-IoT, EC-GSM, GPS), Innocom, and Wisol. The current Sigfox ecosystem is composed of several chipset vendors, device makers, platform providers and solution providers. At the IETF 98 Bits-n-Bites event, March 30th in Chicago, Sigfox demonstrated IoT interoperability with internet compression technology. which enables LPWAN applications to run transparently over different IoT radio access network (RAN) technologies. To achieve this milestone and enable IP applications to communicate over its network, Sigfox and Acklio implemented Static Context Header Compression (SCHC) -a compression scheme being standardized by the IETF IPv6 over LPWAN working group*, which Juan Carlos participates in. SCHC allows reducing IPv6/UDP/CoAP headers to just a few bytes, which can then be transported over LPWAN network small frame size for low-power, low-cost IoT applications. * The focus of the IPv6 over LPWAN working group is on enabling IPv6 connectivity over four different Low-Power Wide-Area (LPWA) technologies: Sigfox, LoRa WAN, WI-SUN and NB-IOT (from 3GPP). The demonstration platform was based on an Acklio compression protocol stack running on Sigfox-enabled devices and cloud-based applications over the live Sigfox network in Chicago. Two scenarios were demonstrated: 1] CoAP requests to legacy IP LPWAN devices, and 2] CoAP interoperability over the live Sigfox and cellular networks in Chicago with IP enabled endpoint devices. Compression based technology for LPWAN application interoperability builds on Sigfox’s commitment to supporting the development of IoT interoperability as an active member of standards development organizations including the IETF, ETSI and IEEE 802. And the number of chip companies providing Sigfox network interfaces (see above list) is equally impressive. Juan Carlos will be following up with a blog post on LPWAN application layer interoperability as well as a more detailed description of the IETF work on LPWANs. At Sigfox World IoT Expo last week in Prague-Czech Republic, Sigfox announced that its network now spans 36 countries, as part of its mission to offer a consistent level of connectivity quality and service anywhere in the world. Sigfox’s network is now available in 36 countries, including 17 countries with national coverage and the addition of four new operators in Costa Rica, Croatia, Thailand, and Tunisia. A new suite of connectivity services which includes the ability to turn any short-range wireless device into a long range IoT device, connect to the Sigfox network in markets where coverage hasn’t been deployed yet, and new interoperability capabilities which allows IoT devices to recognize and automatically adapt to local communications standards without any additional hardware. Partnering with GCT Semiconductor, Sigfox has now launched the first hybrid cellular/Sigfox IoT solution– a chip which can support LTE-M/NB-IoT/EC-GSM and Sigfox IoT connectivity. “We’re excited to work with all of our new partners, this move marks yet another key milestone towards Sigfox’s vision of a global IoT network. We are looking forward to collaborating with our new Sigfox operators to help their local ecosystems to seamlessly scale IoT solutions wherever the Sigfox network is present in the world. Together, we’re building a future that will be better to live in,” said Rodolphe Baronnet-Frugès, Executive Vice President of Operators at Sigfox. Sigfox operators are not only contributing to accelerate IoT development in their local markets, they are also committing to deploy and operate the network infrastructure and offer national coverage in their country. 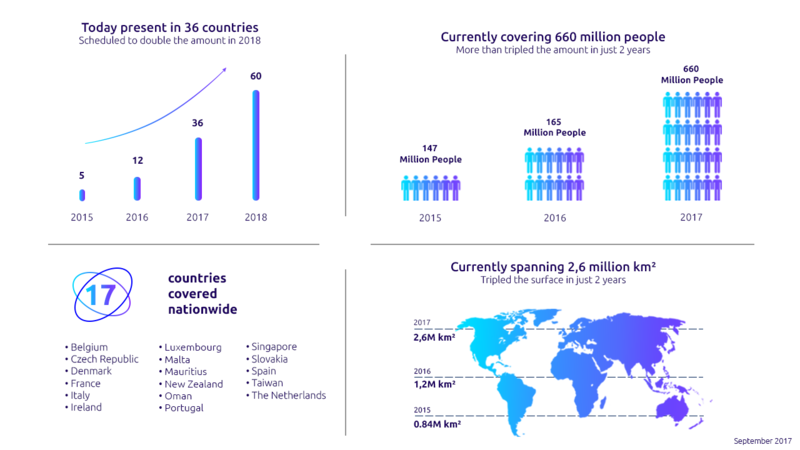 Up to now, almost 100 million euros have been invested by Sigfox operators to offer a unique access to the Sigfox IoT services, with the exact same quality of service. This unique global offer is enriched with Sigfox new service Monarch, now allowing IoT devices to recognize and automatically adapt to every local communications standard in the world without roaming. By enabling ‘globe trotter’ assets that can seamlessly adapt as they move across borders, Monarch could be a game-changer for logistics, freight, and consumer goods industries. In Ireland, Sigfox Operator VT signed a €1-mill IoT subscription with Dunraven Systems, a market leader in the design and development of ultrasonic fuel tank monitors. In addition to its core IoT connectivity service, Sigfox offers a range of services to make even more simple to use Sigfox’s technology, to deploy and to adopt mass IoT solutions. These services allow to connect billions of wireless devices that are not yet connected to the internet. This potential game-changing development has been made possible by the cognitive capabilities of the Sigfox network and its Software Defined Radio technology, where all the network and computing complexity is managed in the Cloud rather than on the device. This enables Sigfox to constantly improve its network features and make them available by simple software upgrade. A key question for Sigfox is whether they’ll also support the new LPWAN standards and specs (LTE category M1, NB-IoT, LoRA WAN, etc). We’ve asked the company and are eagerly awaiting their reply. Stay tuned.